SAN ANTONIO—For years, the San Antonio Rock ‘n’ Roll Marathon and Half extravaganza was plagued by warm temperatures and high humidity in all but the first year (2008). But the race shifted its date to the first week in December last year and it paid off once again with near perfect racing conditions for the estimated 25,000 who participated in one of several races over the weekend. Of course, the biggies were the marathon and half marathon yesterday—especially the half—which served as an Olympic Marathon Trials preview of sorts. 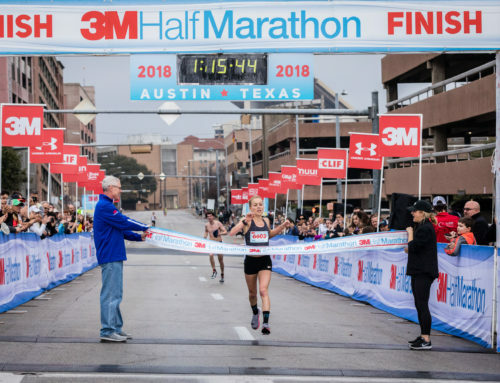 The women’s field in the half was particularly noteworthy as three of the top four women from the ’12 Trials were in San Antonio for their final tune up before the Los Angeles Trials Marathon. 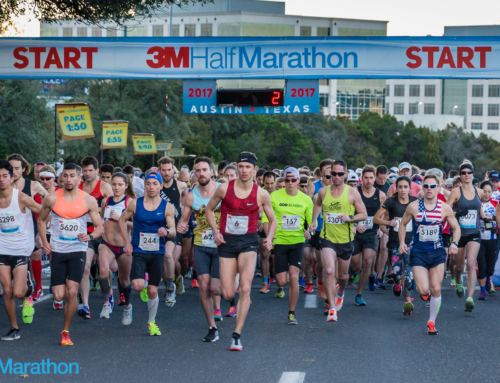 But, as was made clear even before the start of San Antonio, the plan for the top women wasn’t to race the half as much as put in a solid, yet sub-max effort. And that’s exactly what happened. Former Olympians Kara Goucher and Amy Cragg as well as three-time Olympian and one-time San Antonio champ Shalane Flanagan ran well under control and none of the three raced the half. Goucher put a little bit more effort into it than Flanagan and Cragg who train together and were under specific orders not to run faster than 5:40 per mile pace. Goucher, who knew beforehand that neither Flanagan or Cragg had any intention to be competitive, appeared content to run among a large group of men for the first few miles, but then, on a hilly section through the Trinity University campus around the six-mile mark, left the guys behind as well as Flanagan and Cragg. The same could be said for Flanagan and Cragg who seemed content to follow their coach Jerry Schumacher’s orders and ran together nearly the entire way along with Sasha Gollish of Canada and Kellyn Taylor. Gollish grabbed second in a huge PR of 72:35, while Flanagan and Cragg finished together in 72:42 with Taylor in fourth in 73:19. The men’s half was won by Aaron Braun in 1:04:11 with Jeff Eggleston second in 1:05:44 and Phillip Baar third in 1:06:39. Adam Waldum of Austin, who works at Rogue, fought off muscle cramps in the 11th mile and still finished seventh in 1:11. In the marathon, Mark Greene of San Antonio won in 2:31:31 with Dave Rodriguez second in 2:33:03 and Jose Roberto Zavala Calderon third in 2:35:28. Fastest Austinite was 49-year-old Phillipe Bochaton who just missed his goal of a sub-three hour time, but still won his age group with a fine effort of 3:00:47 (20th overall). Also having good races were Austinites Dan O’Dwyer (3:04:36), Matt Sorenson (3:07:22) and Jesus Olivera (3:08:55). 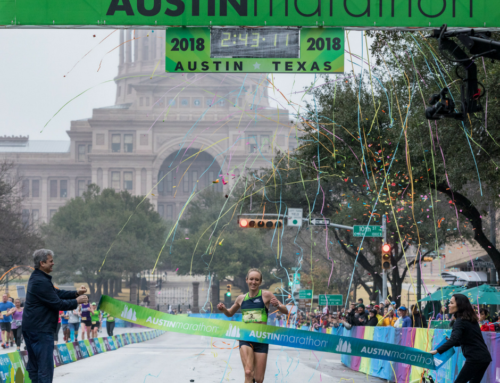 Top Austin woman was Julia Vegas who was fifth in 3:18:05 with Emily McCoy (3:21:18) in seventh in the marathon which was won by Stephanie Wurtz (2:58:54) of Colorado. In other news, the city of San Antonio and the Rock ‘n’ Roll organizers—Competitor Group, Inc.–agreed to a new five-year deal which will keep the Rock ‘n’ Roll Marathon in the Alamo City. The race, which began in 2008, had been in the final year of a five-year extension with the city but the new contract will keep Rock ‘n’ Roll in San Antonio at least through 2020 with an option for two additional years. According to San Antonio Sports, the ’14 Rock ‘n’ Roll Marathon pumped $26 million into the local economy. Next year’s race date is December 4th.